Planning your training based on time is easy, but only takes half of the equation into account by ignoring intensity. While setting up a year by duration works well for many athletes, the more advanced athlete looking to podium, qualify, or reach a lofty goal should consider planning with Training Stress Score (TSS). Planning with TSS will account for both the duration and intensity of a workout and allow you to model Fitness (CTL) and Form (TSB) in the Performance Management Chart. Training Stress Score (TSS) is a composite number that takes both the intensity and duration of your workout into account. Each workout you do is assigned an Intensity Factor (IF) which is how hard that workout was relative to your Functional Threshold, or the max effort that you can sustain without fatiguing for around one hour. We then look at how long the workout was and assign it a score. Planning workouts in this way will allow you to more precisely control the training stress and load on an individual basis. To get started planning with TSS follow the steps below. 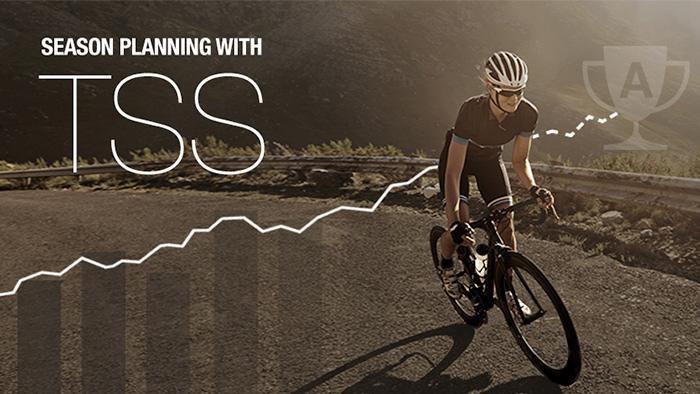 Log into your TrainingPeaks account and click the Annual Training Plan (ATP) tab at the top of the page, then click ‘get started’ or the ‘+’ icon to create a new ATP. Next, select Weekly TSS or Event Fitness as your methodology. To create an ATP based on weekly TSS you will need to enter your weekly TSS goal. This can be determined in several ways. 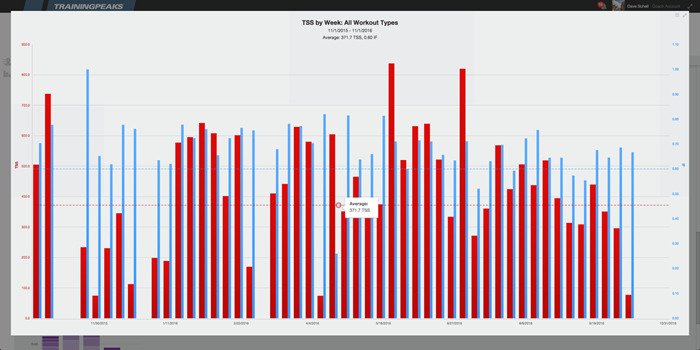 The easiest way is to use the TSS by Week Chart (see below) in the Dashboard to look back at past seasons to see what your average weekly TSS was, make note of some of the numbers and calculate the average. If your last season was a good one, and you feel like you could handle a little more training load without risking illness, injury, or overtraining, consider adding ten percent to this number. If your average was 500 TSS per week, consider increasing it to 550 TSS. Now enter that number into the ‘Weekly Average’ field in the ATP under ‘Determine Training Volume’. Once you have completed the other required information, such as date range, current fitness, and adding an ‘A’ Event, click ‘Create ATP’ and your Annual Training Plan will be automatically created, giving you a target TSS number to hit each week. Look at the charts below for some general guidelines based on event type, duration, and ability level. Estimate based on your last season’s average weekly hours and average Intensity Factor using the simple IF2 x duration in hours x 100 equation. If you question the validity of your average TSS due to an incorrectly set threshold or some other reason, you can estimate based on average hours and average Intensity Factor. For runners, weekly average IF tends to be around .83-.9, for cyclist between .6-.7 and multi-sport athletes around .8-.85 IF. So, if we use .65 as our average IF and 10 hours as our average weekly hours, it would look like .65 x .65 = .4225 x 10 hours = 4.225 x 100 = 422.5 TSS per week. Caveat: Using this method is extremely general and IFs could vary greatly, but it will work in the absence of good historical data. The other option you have is to set a target Fitness (CTL) that you would like to arrive at on race day. The ATP will calculate the weekly TSS required to hit that target. As with weekly TSS, this number is best determined using historical data. However, you can also use the charts below as a starting point based on the event and ability level. Warning: Starting with a low Fitness (CTL) and trying to reach a high target Fitness (CTL) that your body is not prepared for, may result in excessive ramp rates possibly leading to illness, injury, or burnout. Like creating an Annual Training Plan with TSS, there are several ways to go about planning a workout with TSS. Below are some of the most common ways, listed from easiest and least accurate, to advanced and more accurate. Estimate TSS per minute by sport type. This is one of the easiest and quickest ways to get started creating workouts based on TSS. This takes into account how different sport types can be more intense due to the stress it imposes on your body. For example, you can coast in cycling where as you can’t in other sports such as running or swimming. You can use this as the basis for easy to moderate workouts and adjust up or down based on that day’s workout. Swimming = 1 TSS per active minute of swimming, so a 60 minute swim would equal 60 TSS. Cycling = Slightly less than 1 TSS per minute, so a 60 minute ride might equal 50 TSS. Running = Slightly more than 1 TSS per minute, so a 60 minute run might equal 65 TSS. Estimate TSS from subjective effort level and duration. Another easy way to estimate is by subjective effort level assigning a ½ point per minute for an easy workout, 1 point per minute for a moderate workout, or 1½ points per minute for a hard workout. A one hour workout at each level would equal 30 TSS for an easy workout, 60 TSS for a moderate workout and 90 TSS for a hard workout. Estimate based on Rating of Perceived Exertion (RPE). Another easy way to estimate TSS is based on RPE, or how hard the workout felt. Joe Friel recommends the following based on a 10 point RPE scale or average heart rate zones. A one hour long workout at an RPE of 4 would equal 50 TSS. Estimate based on Intensity Factor and Duration. If you know the Intensity Factor you would like to average for the workout you can square that number and multiply it by duration in hours, then multiply that number by 100.. IF2 x duration in hours x 100. So, if you wanted to perform a one hour long moderate workout with an intensity factor of .7 (or 70% of FTP) it would look like this .7 x .7 = .49 x 1 hour = .49 x 100 = 49 TSS. Another way to think about it is IF as a percentage of threshold where 100% of threshold, or an IF of 1.0, would be pretty hard, and 55% of threshold, or an IF of .55, would be relatively easy. Planned fields on a workout. If you know the IF and duration, enter those into the planned fields and TrainingPeaks will calculate the Training Stress Score. If you know the TSS you want to hit and the goal IF of the workout, enter those and we will calculate duration. There are many ways to plan for your best season ever, but whether you are a coach wanting to take your athletes to the next level, or an athlete looking to optimize your performance, planning with TSS will individualize your approach to planning and help you reach your peak performance. Learn more about why you should plan your season with TSS.